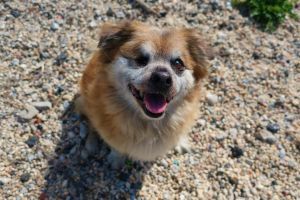 Hi My name is VIDAL and I am a very sweet adult FIVE YEAR old MALE POMERANIAN mix. I weigh just 25 pounds so you can easily take me anywhere. And with my stunning soft, tan and white coat, I’m sure to be a head turner! You may notice that I have only one eye. Don’t worry it doesn’t stop me from doing anything other dogs can do! If your looking for an easy going, laid back, perfect little companion who DOES NOT BARK, you’ve found him. I will lay at your feet contentedly watching tv or snuggle with you. I also happily go on long walks, am great on the leash and I also calmly ride in the car. Like I said, it’s easy to take me anywhere! I am perfect for any family and can’t wait to add so much love to my forever home. Right now I’m living with other DOGS and CATS and I also love CHILDREN. I am vetted with shots HW negative and microchip. I also just had my teeth cleaned at the Vet, so I’m ready to go to my new home with a healthy smile. Come meet me!